An indicator of ecosystem quality is the number of qualifying species present in protected natural areas. A comparison between the periods 2006-2012 and 2000-2005 shows that the size of the area containing a high number of qualifying species is still declining. The biggest decline is in heathland ecosystems, where the area with a low number of qualifying species is increasing. Besides the national average trend in ecosystem quality (see link below this paragraph), information is given on ecosystem quality in different areas. This quality is based on the number of qualifying species (butterflies, plants and birds) present in the natural areas. The ecosystem quality in about 30% of the total natural area is higher than the median number of observed qualifying species. In these areas more than 50% of the maximum number of qualifying species are found in all the different management types. Open dune habitats contain the largest area with relatively high numbers of qualifying species and therefore have retained more of their biotic quality than other habitat types. Semi-natural grassland and marsh ecosystem types contain large areas with few qualifying species and therefore have a relatively low quality. The changes in the area with high ecosystem quality were determined by comparing the period 2006-2012 with the previous period (2000-2005), which shows that the size of the area with a high number of qualifying species is still declining. Heathland ecosystems are particularly affected by a declining area with a high number of qualifying species and the area with a low number of these species is increasing. Land reclamation, agricultural intensification and a reduction in the influence of sea and river dynamics have led to a reduction in geophysical diversity in space and over time, and therefore also in the biodiversity of ecosystems. 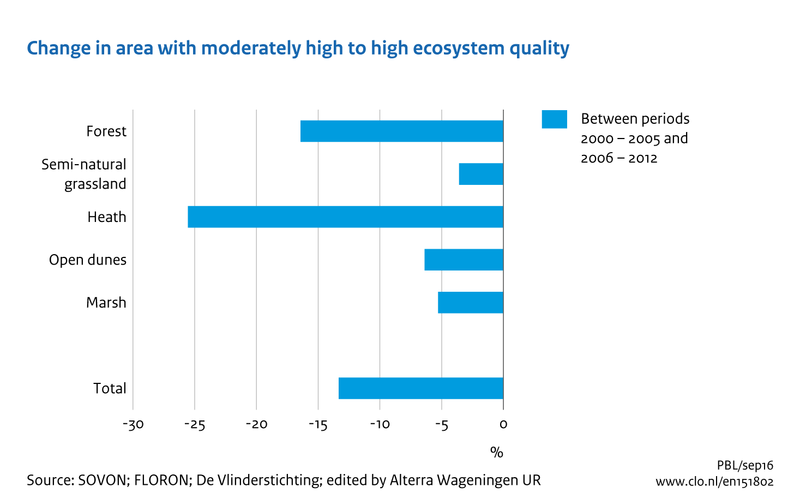 Places with an above average number of qualifying species are found mainly in the larger natural areas, such as the dunes, the Veluwe and a few larger marsh and heathland areas. The high ecological quality in these areas is due mainly to the variation in water, environmental and land use conditions, caused, for example, by the presence of relief and dynamic landscape-forming processes. A greater degree of spatial connectivity and better environmental conditions where disturbing land uses and activities are further away also helps to improve ecosystem quality. There are also regional differences in the pressures on the environment, while habitats on nutrient-poor sandy soils are much more sensitive to eutrophication and acidification than those on clay soils. All these factors have a major influence on the presence of qualifying species and therefore on the differences in ecological quality. It is expected that management measures will lead to an increase in the area with a high number of qualifying species, and therefore a higher than average ecological quality. In the Nature Pact (Natuurpact) the national and provincial governments have agreed to raise ecological quality through more intensive restoration and management measures to improve water and environmental conditions. The Nature and Landscape Management Subsidy System (SNL) supports the maintenance and improvement of ecological and landscape quality in the Netherlands. The provinces are responsible for implementing nature policy and need to know whether or not the desired ecological quality (policy targets) can be achieved via the SNL. National government needs information about ecological quality within the National Ecological Network. The method for assessing ecological quality is set down in the 'monitoring and evaluation methodology' (WMBN). One of the indicators of ecological quality used in the WMBN is the presence of specific plant and animal species, or qualifying species. At the moment data is being assembled according to the WMBN methodology, but the data required to describe ecological quality according to this methodology are not yet available. The method currently being used is therefore an approximation of the WMBN methodology. BIJ12 (2014). Werkwijze Monitoring en Beoordeling Natuurnetwerk en Natura 2000/PAS. Versie 05032014. BIJ 12, Utrecht. BIJ12 (2014). BIJLAGE I - bij: Toelichting Werkwijze EHS- en Natura 2000 / PAS Monitoring en Beoordeling. BIJ12 (2014). BIJLAGE II - bij: Toelichting Werkwijze EHS- en Natura 2000 / PAS Monitoring en Beoordeling. IPO (2015). Natuur in de provincie. Eén jaar Natuurpact in uitvoering. Interprovinciaal Overleg. Voortgangsrapportage Natuur. Ministerie van Economische Zaken, Landbouw & Innovatie, Den Haag. LNV (1990). Natuurbeleidsplan. Regeringsbeslissing. Ministerie van Landbouw, Natuurbeheer en Visserij. Den Haag. Ministerie van Economische Zaken (2013). Kamerbrief Natuurpact. Ministerie EZ (2014). Natuurlijk verder. Rijksnatuurvisie 2014. Ministerie van Economische Zaken, Landbouw & Innovatie, Den Haag. Reijnen, M.J.S.M., R. Pouwels, J. Clement, M. van Esbroek, A. van Hinsberg, H. Kuipers & M. van Eupen (2012).Doelrealisatiegraadmeter voor de Ecologische Hoofdstructuur. Natuurkwaliteit van landecosysteemtypen op lokale schaal. WOt-werkdocument 305. WOT Natuur & Milieu - Wageningen UR, Wageningen. Reijnen, M.J.S.M. , A. van Hinsberg, M.L.P. van Esbroek, B. de Knegt, R. Pouwels, S. van Tol & J. Wiertz (2010). Natuurwaarde 2.0 land. Graadmeter natuurkwaliteit landecosystemen voor nationale beleidsdoelen. WOt-rapport 110. WOT Natuur & Milieu - Wageningen UR, Wageningen. Sierdsema H., C. Kampichler & L. Sparrius (2014). Verspreidingskaarten van hogere planten ten behoeve van de kwaliteitsbepaling SNL. Sovon-rapport 2014/20. Sovon Vogelonderzoek Nederland, Nijmegen. Swaay, C.A.M. van (2013). Natuurkwaliteit voor dagvlinders van de SNL beheertypen. Rapport VS2013.014, De Vlinderstichting, Wageningen. Sanders, M.E., G.W.W Wamelink, R.M.A. Wegman, J. Clement (in prep). Indicatoren realisatie beleidsdoelen voor natuur. WOt-technical report. WOT Natuur & Milieu - Wageningen UR, Wageningen. CBS, PBL, RIVM, WUR (2016). 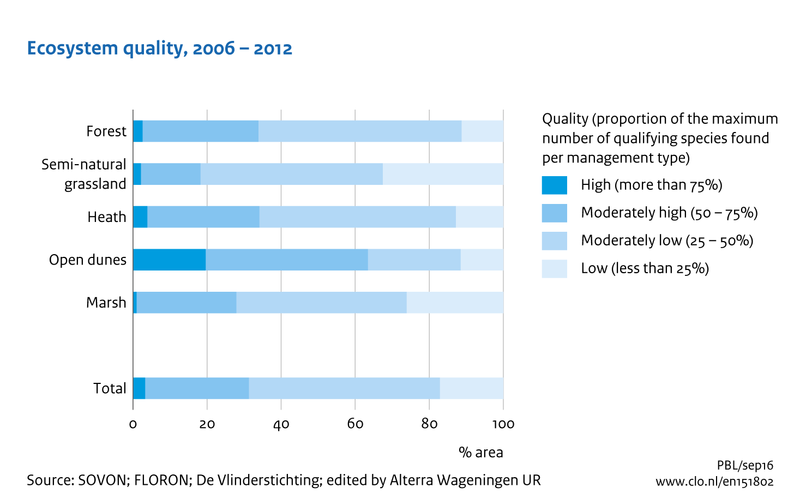 Ecosystem quality, 2012 (indicator 1518, version 02 , 19 October 2016 ). www.environmentaldata.nl. Statistics Netherlands (CBS), The Hague; PBL Netherlands Environmental Assessment Agency, The Hague; RIVM National Institute for Public Health and the Environment, Bilthoven; and Wageningen University and Research, Wageningen. The Environmental Data Compendium is a partnership of CBS, PBL, RIVM and WUR.